US President Barack Obama unveils his 2012 budget Monday, proposing a raft of spending cuts and tax hikes aimed at curbing a record budget deficit. Obama on Monday proposed reining in expenses at NASA, sending his 2012 budget blueprint to Congress calling for a five-year freeze on new spending at the US space agency. President Barack Obama on Monday proposed reining in expenses at NASA, sending a 2012 budget blueprint to Congress that calls for a five-year freeze on spending levels at the US space agency. Obama would restrict NASA's budget to last year's levels, $18.7 billion annually through fiscal 2016. The figure represents a 1.6-percent decrease from the spending total the agency had sought for fiscal 2011, which ends in September. "This budget requires us to live within our means so we can invest in our future," NASA Administrator Charles Bolden told a news conference. Bolden sought to put a brave face on the budget limitations, saying the administration's proposal "maintains our commitment to human spaceflight" and research. Experts said it reflected Washington's new fiscal reality, framed by voter frustration with excessive government spending. "There is not a lot of money available," said John Logsdon, a former director of the Space Policy Institute in Washington. "It should not compromise what NASA wants to do but it certainly would slow it down," said Logsdon, an independent consultant to the Obama administration. The belt-tightening comes just as the United States winds down its space shuttle program, and struggles to move forward on a replacement for the vaunted vessels that have carried hundreds of astronauts into space. Nearly half of Obama's proposed 2012 NASA budget -- and for the next five years -- is dedicated to space operations and exploration systems, including $2.9 billion for the development of a heavy launcher and a space capsule intended for missions beyond low Earth orbit. Seven billion dollars have been earmarked for work aimed at making the new heavy launcher operational by 2016. It will be crucial for sending astronauts beyond low Earth orbit to an asteroid and to Mars. NASA has not yet determined the architecture of the system nor when it will be operational. Obama's budget would continue to push for commercial partnerships to develop reliable access to the space station and lessen the reliance on Russia, whose Soyuz spacecraft will be carrying US astronauts to the ISS until a shuttle successor is developed. The draft budget proposes 850 million dollars in 2012 as seed money to help companies like SpaceX -- which has already successfully launched a prototype space capsule into orbit. 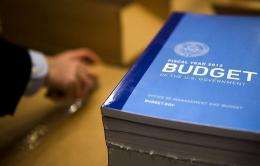 A final US budget for fiscal 2011 has not been approved because Democrats and Republicans failed to agree on spending levels in the runup to last November's mid-term election. At that time, Obama and fellow Democrats decided to maintain 2010 levels. But Republicans won control of the House of Representatives and they are vowing massive spending cuts for the remainder of fiscal 2011 and beyond. "We don't know what NASA will get in 2011," one administration official said. Another administration official close to the National Aeronautics and Space Administration, speaking anonymously, warned that deeper cuts could put the space programs at risk. "If the Republicans get their way all of this is in jeopardy," the official said. Good move Obama, NASA has always overspent and been overbudget. Big businesses need those handouts and we have to make cuts somewhere, and since NASA is trivial, this is a logical place to take some money from. You are wrong. It is bussiness (like semi-conductor corporations) that fund(hire) reasearchers in universities are far greater. Also NASA just has less money to spend on outsourcing these corporations, and we are in a round circle. You do not understand my point at all. NASA has no direct influence on economy besides the draining away of taxes. That is partialy true. However you think the US is high-tech, In The Netherlands we have alot more higher tech military than in the US. Also in these modern days the consumers often have newer technology than the privates or NASA are using. Ofcourse this is like comparing apples to pears, but just trying to make a point you are over-stating. Also the reason for pulling away taxes from NASA and putting it in other areas, obviously if the economy cannot support the people investments in certain technology are useless and the ecenomy requires more direct solutions to its problems. NASA is .5% of the Federal Budget and .1% of the GDP. It's far too small to care about if you want to be fixing the economy, especially since it provides a quarter of the funding of science research in the US. And how big is america? Ratios mean nothing here. If a project can be done in 5 million budget, it wont go any better with a 10 million budget, maybe even worse cause of lackness or overspending etc. How much money is there in the world? And how much of that money is used for research? The numbers you give mean nothing. But i agree about you at one point there are other areas the budgets could be cut down. Beware: There are two Goddards associated with NASA. 1:The good one that most want to sopport = Goddard Space flight Center in Beltsville, Maryland, is an authentic space-sciences-oriented arm of NASA and is where the Office of Solar System Studies is HQ'd. The scientists who work here conduct real science! 2: The bad boy and the blood sucking leach of the family(GISS) The Goddard Institute of Space Science in New York, where James Hansen lurks and manipulates temperature record at will even though hes been caught out countless times. So I say de-fund the most useless part of NASA - GISS. Believe me the real NASA Will be very grateful to get rid of that embarrassing data fudging group! A good start to stop the chronic budget blowout culture at NASA. It is time for NASA to stop having showers in the desert. Good from what i see is that NASA is just one big beuracracy not a science groupe. They wast money and resist change because they know that America will provide more $$$'s when needed. Now perhaps they will be forced to spend there budget more wisely and actuall achieve real research for a change for a good price. Most of NASA operations need to be outsourced to private companies such as Bigelow, SpaceX, SpaceDev or ULA. Particularly ULA could enable NASA to profit from huge DoD budget. As much as I dont like cutting money for space exploration, 18,7 billion is enough for an ambitious space program. What NASA needs is not more money, but better efficiency. That is partialy true. However you think the US is high-tech, In The Netherlands we have alot more higher tech military than in the US. "'This budget requires us to live within our means so we can invest in our future,' NASA Administrator Charles Bolden told a news conference." What the H does that even mean? This guy is a political hack trying to put Obama's buzz words into a statement and getting an incoherent result. The entire article is political regurgitation. How much did the current administration and the previous congress raise NASA's budget in the last couple of years? Now we pretend to be responsible and put a "freeze" on the raise. The last congress was irresponsible and didn't even bother to pass an annual budget. Why? My guess is they didn't want to be held responsible for the massive spending. Bottom line is we're broke. We are printing money and then lending it to ourselves. They are happy with that in Washington as long as the real inflation doesn't hit until there is a scapegoat in place. Much of the previous economic meltdown was the collapse of residential mortgages, basically letting people buy homes who have no means of paying it back. So what will our children be faced with? They will be paying THIS "mortgage", but won't get the house to live in! How's that for investing in the future? This administration talks about a trillion in savings (compared to what?) over the period of time where their budget plan doubles the national debt while trying to peddle it all as "living within our means". Kaasinees, please enlighten me on how your military is more "high-tech" than ours. I'm very familiar with both sides and can't think of a single instance of the Netherlands outpacing us... although I'd gladly like to hear evidence of such. PS. I'm not bashing your military, they're really awesome and hard-working folks! No, ratios are all that matters. A few billion dollars is *nothing* in terms of the US budget, the only reason to bring it up is because stupid people are scared of large numbers. NASA's budget is *tiny* in real terms but reducing it has *huge* impact on scientific work in the US because it uses so much of its money to fund that kind of work. Yes and NASA having a smaller budget will drive NASA to be more efficient and creative with it, possibly even pushing forward their efforts, cause man-hours cost money and also to show more progress to get more fundings next time, imagine them showing less progress their budget will shrink AGAIN. A few billion dollars is *nothing* in terms of the US budget, the only reason to bring it up is because stupid people are scared of large numbers. What are you talking about? Maybe it is nothing to the total number, but it is a huge diffrence for individual budgets like NASA, or some other field like energy research or medic research. That is why i am saying your ratios mean nothing here. I'd like to see a freeze and reduction in the Defense (Offense) budget. An Organizational like NASA does not their budget freezed. How about we stop spending 20 Billion a year on private military contractors, instead of freezing the budget on a peaceful and productive agency like NASA. They are looking in the wrong direction. Mr. President, I respectfully say that you and your staff are morons. This spending freeze is less than 1/5000th of the deficit, and not even worth the time you jackasses spent on it. Do you people know what a trillion dollars is? Even 20 billion is chump change. 1.5 trillion = 1500 billion. Hey, I know, let's totally disband and defund the military! And this doesn't even start to hit on the notion that one day we should "somehow" pay back the principle on the debt, seeing as how paying a few hunded billion per year in interest is starting to bleed this nation dry. Which is MORE than the cost of the Military you morons complain about. The ONLY place they are going to find that amount of money is through taxes and through reforming social security and other entitlements. The retirement age needs to be pushed back by another 5 years or so, even retro-actively if possible. Benefits for disabled and as well other fraudulent claims need to be more closely regulated and screened to be sure these people really need and deserve what they get. America is in for some very hard times if we keep electing the fools who are in office now or people like them. They will not make the hard choices that are needed to put the nation back on track. Look at Greece and it's abyssmal failure. America is living a fairy tale where people have been lied to for generations, believing social security and other entitlements were going to somehow allow them to live like kings forever, even after they retire. SOMEBODY has to get real and end these fraudulent programs which are based on a fairy tale economic model that doesn't work.